The Italian for smoke, is the regular -ARE verb fumare. ... imagine the girl says, "Why do you smoke? The FUMES are bad for you!" 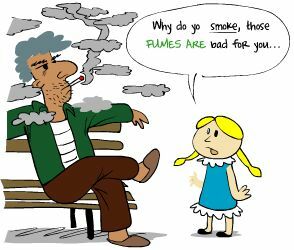 Fumare is a regular -ARE verb conjugated like thousands of other -ARE verbs. Conjugate this and you'll be able to conjugate other -ARE verbs. - Vietato fumare! : No smoking! - fumare di rabbia (v) : to fume with rage/anger. - fumare la pipa (v) : to smoke a pipe. - fumare 20 sigarette al giorno. : to smoke 20 cigarettes per day. Smoke learn Italian using proven techniques like Cartoon Memory Triggers. "Why do you smoke? The FUMES are bad for you!" non fumare! (non) fumi! (non) fumiamo! (non) fumate! (non) fumino! ✔ Fumare is a regular -ARE verb, these being the most common verbs in Italian. ✔ Learn fumare and it will reinforce the pattern for ALL those other -ARE verbs. ✔ You can more easily remember words and verbs like the Italian for smoke fumare using the techniques of the world's Memory Masters. 200 Words a Day! Free Daily Italian Lesson Online - the verb in Italian for smoke, is fumare - fully conjugated. Italian Learning Made Fun and Fast with your free Daily Italian Verb Lesson - fumare.